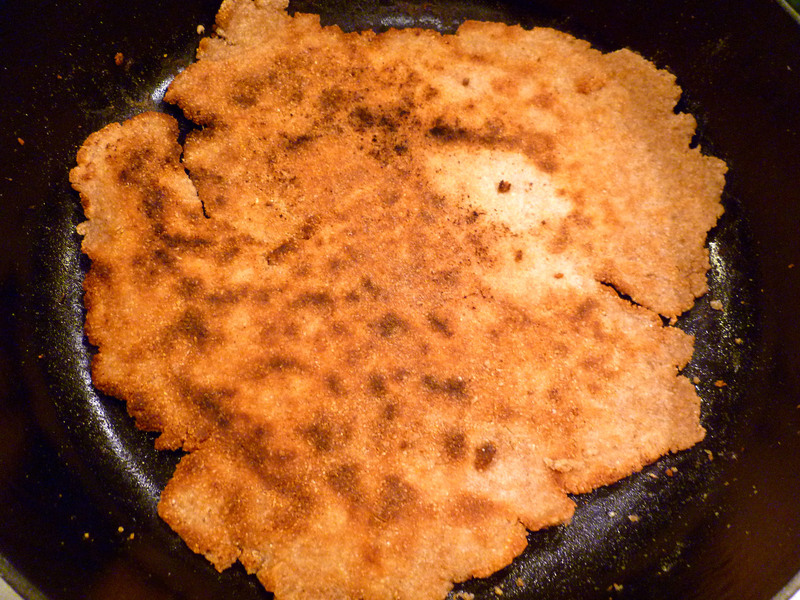 The flatbread I made is a very simple, very rustic, yeast-less quickbread. If you don’t have time, just substitute store bought flatbread or tortillas. Toss in a heated skillet (preferably cast iron) then cook until browned. 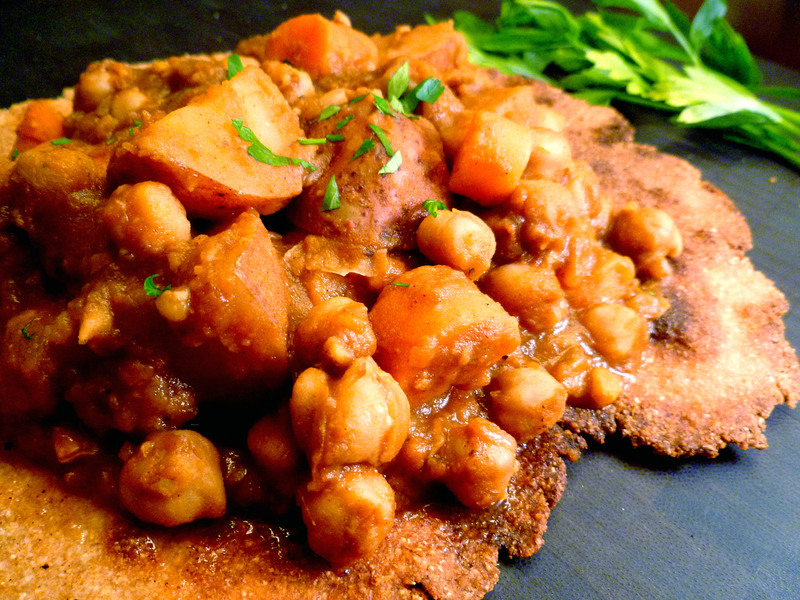 Serve stew over flatbread and garnish with chopped parsely. Preheat oven to 450 degrees. If using canned chickpeas, rinse and drain. Toss chickpeas with 2 tablespoons of the olive oil on a large rimmed baking sheet. Layout in single layer then roast in the oven for about 16-20 minutes, stirring occasionally, until somewhat dreid out and golden brown. Remove from oven and set aside. Meanwhile, heat remaining 2 tablespoons oil in large dutch oven or heavy bottomed pot over medium heat. Add chopped onions and saute for about 7-8 minutes. Add the ginger and garlic and saute for another 5 minutes. Meanwhile mix all the spices from paprika to ginger together in a small bowl and set aside. Add the spice mix to the onions, ginger and garlic then saute for about 1-2 minutes or until spices are fragrant. Stir in tomato sauce and cook, stirring frequently, being careful to not let mixture burn. (some brown is okay as this will create flavor you will soon deglaze). Add in the broth, carrots and reserved chickpeas. Scrape the bottom of the pan to deglaze then bring to a boil and then lower heat to a simmer. Cover and simmer for about 10 minutes then add the potatoes. Cover and simmer another 30-40 minutes, stirring occasionally, until stew it thickened and vegetables are very tender. Turn off heat and let sit for about 5 minutes to thicken. Lay out 1/2 round of flatbread OR 1/2 baked whole wheat pita or naan in a large bowl or plate and ladle stew over it. Slowly add milk and melted butter mixing until just combined – don’t overmix! Make small softball size balls (see picture). 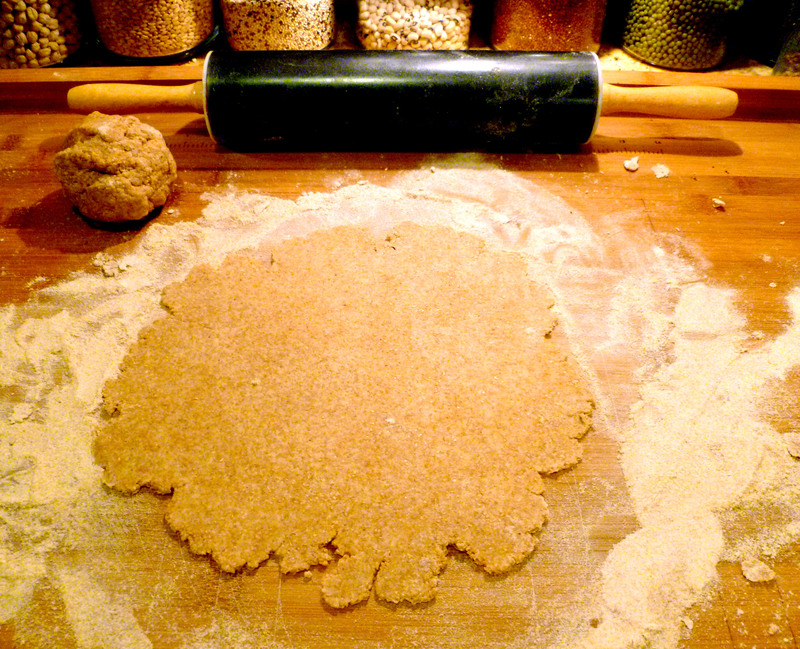 On floured surface, roll out balls to a very flat round shape. It’s okay if the edges are not perfect, this will add character. In large cast iron skillet, sprinkle pure olive oil (it has less olive oil than extra virgin) or canola oil in the bottom of the pan over medium low heat. When oil is glistening, add rolled out dough. Cook for about 3-6 minutes or until golden brown with some dark edges/spots. Flip over and add more oil if necessary. Cook the other side evenly then remove from pan and repeat with other dough until all are cooked. Cut rounds in halves or quarters lay out a piece on a plate then spoon stew over it. Sprinkle with chopped parsely for garnish andserve.